Home › Jewish Techs Blog › Jewish Holidays? There’s An App for That! 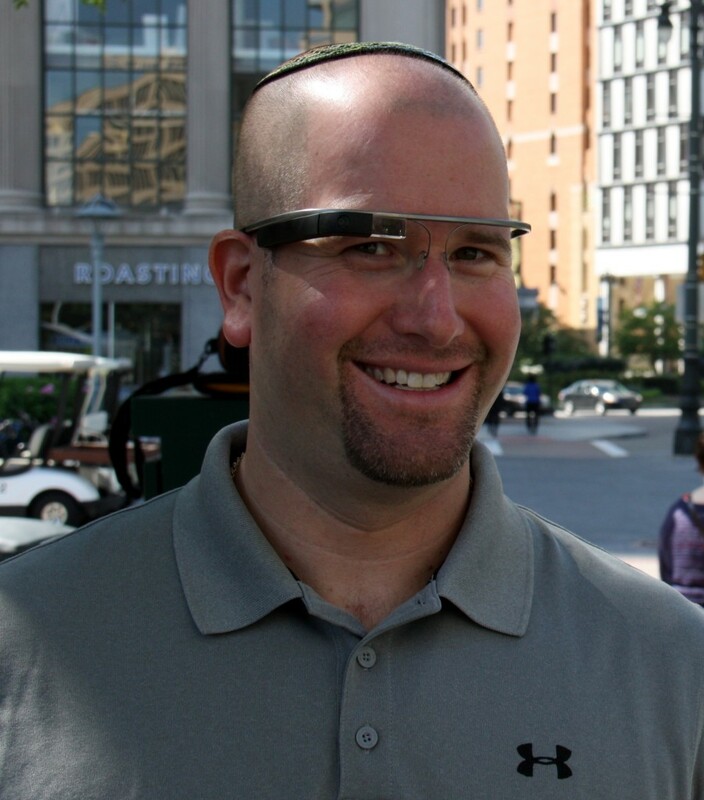 I wasn’t surprised that a reporter from the New York Times contacted me about mobile apps for Passover this year. I was just surprised it took her that long. Jennifer Medina, a reporter for the NY Times, called my cellphone a couple days before the first Passover seder this year. I excused myself from my children’s mock seder at their Jewish day school and took the call. 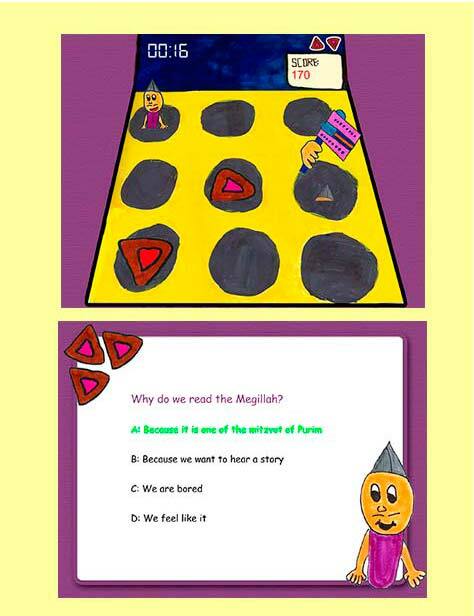 Medina was looking to write about specific mobile apps that could be used on an iPad to supplement the traditional Passover Haggadah at the seder table. I listed a few Passover Haggadah apps for her article, but the truth is that there were dozens more Jewish holiday apps for Passover I could have listed. Not all are mobile apps that can be used in place of a traditional Haggadah as many are resource apps or games — fun games, educational games and a mix of both. Rosh Hashanah and Yom Kippur are a time to look inside ourselves, acknowledge our shortcomings, and commit to being better people. 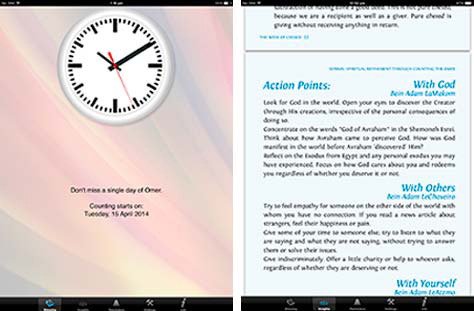 High Holiday Highlights, by eXQuisite Software ($4.99), taps into this theme of spiritual growth, encouraging self-reflection in answers to questions like “How do I get ‘connected’?” It also includes prerecorded prayers. But if you’re after a simple lesson in why and how we celebrate the Jewish New Year and Day of Atonement, this isn’t the place to look. Instead, you could try Rosh Hashanah – The Jewish New Year, by Saturday Buffet ($1.99 for the full version): an educational app that teaches kids (and adults) why and how we celebrate Rosh Hashanah. The app looks like a children’s storybook, with a small amount of information on each illustrated page. It provides the option of having a narrator read the information aloud, and teaches Hebrew words along the way. There is a free version, but it’s really only a teaser for the full app, providing access to five of the 12 pages. 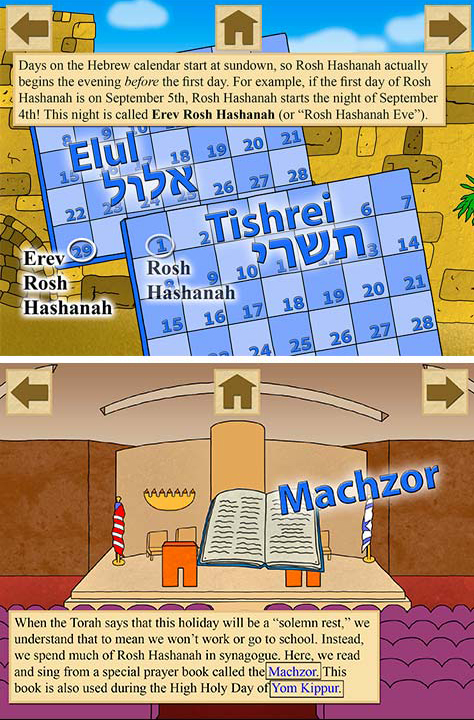 While the illustrations are lovely, and the educational information focuses on the key lessons of Rosh Hashanah, the app doesn’t really have a fun selling point. While you’re outside building a real-life sukkah, let the kids build a virtual one using Sukkah Challenge 4 Jewish Kids, by Jewish Interactive ($1.99), which lets users shake a lulav and earn virtual shekels by studying religious texts, in addition to building an e-sukkah. The big advantage of this app is that it encourages children to engage with the holiday via animated clips and interactive games. The downside is that it’s not much fun for grown-ups. If, on the other hand, you want to eat in a sukkah but don’t want to (or can’t) build one yourself, Local Sukkah, by Local Sukkah (free), could come in handy. Using a crowdsourced registry, Local Sukkah maps out where there’s a sukkah near you that’s open to guests. This could provide a great opportunity whether you’re staying in your own neighborhood or traveling over the holiday. It must be noted, though, that while in theory this app looks useful, at the time of publication it was not available in Tel Aviv – probably because no one registers any sukkahs in the middle of winter. But it’s certainly worth a try around Sukkot time. Check out Kinnor Software’s Trope Trainer in the Apple AppStore. At $24.99 it’s a bit expensive for an app, but it will do a good job of teaching you to read the Torah trop (cantillation) in time for Simchat Torah. There are plenty of apps to choose from for Hanukkah, probably because it’s widely perceived as the Jewish stand-in for Christmas (in fact, when you look for “Hanukkah” in the App Store, Christmas apps show up too). There are apps for making cards, telling holiday-themed jokes and lighting e-menorahs, but the best of them is Appy Chanukah, by Alin Wagner ($1.99), which teaches children about the customs of Hanukkah, and helps them make cards and learn holiday songs. There’s also Hanukkah: The Festival of Lights StoryChimes, by Idea Den ($1.99), an interactive storybook that also has a memory game, and Hanukkah Menora, by appSTUDIO (free), a no-frills app that provides the candle-lighting blessing and an e-menorah to light. 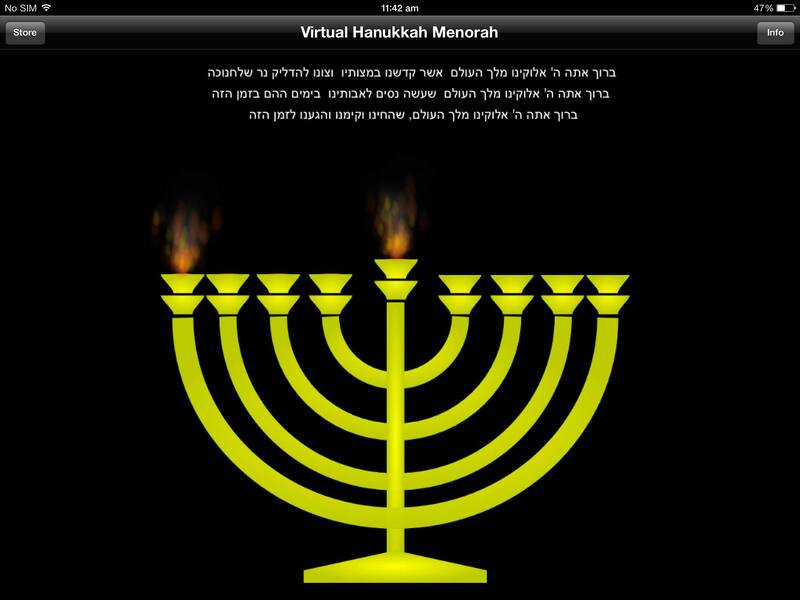 While using a virtual menorah doesn’t quite capture the spirit of the Festival of Lights, this app may be the closest you can come if you are traveling or ran out of matches – and it’s much better than some of the other e-menorah apps out there, which have soundtracks that make you want to reach for the earplugs. IThankYou – Modeh Ani, by Jewish Interactive ($0.99), focuses on gratitude, linking the app’s Tree of Thanks with Tu Bishvat. Children can learn here about the tradition of eating foods from the seven species, along with when, how and why to say the Modeh Ani morning prayer of thanks. While not the most innovative of apps, it does the trick. Megillas Esther — Story of Purim, by RustyBrick, Inc. (free), includes Purim prayers, the megillah, and even noisemakers to drown out Haman’s name during the reading of the Book of Esther. The free edition includes five noises – a traditional Purim grogger, or noisemaker; a gun; firecrackers; an air horn; and a crowd booing – and for $0.99 users can upgrade to include six more sounds. In addition, it has a “Haman highlighter” to alert you when the bad guy’s name is coming up. The app does have one key shortfall: The Megillah is not accompanied by an English translation. For a bilingual experience, try the JOFA Megillat Esther, by Jewish Orthodox Feminist Alliance ($1.99). Whack-a-Haman, by Jewish Interactive (free), is a simple, fun and educational game to help children engage with Purim. Playing it took me back to my youth, when I spent hours whacking virtual crocs with an oversized red foam hammer on the left and my bare paws on the right. The app’s icon and the preview images in the App Store are amateurish, which is a turn-off at first, but there’s a reason for it: The illustrations were drawn by seventh graders. And the quiz questions that are interspersed throughout the game were written by sixth graders, according to the app’s developer. The game’s main shortcoming is that the grogger used to whack the villain of the holiday doesn’t always keep up with the player’s tapping speed. Nevertheless, Whack-a-Haman is a fun way for children or adults to pass the time if listening to the megillah starts to get boring. 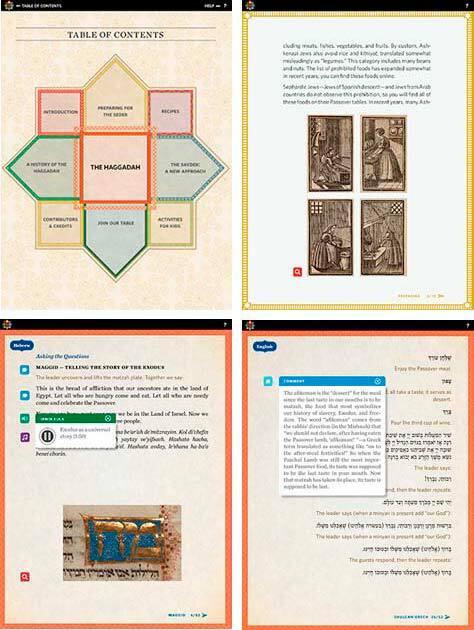 The Haggadah, by Melcher Media ($4.99), is an all-in-one Passover app. Among other features, it includes activities for children, recipes, instructions on how to prepare for the holiday and, most importantly, a Hagaddah. The Hagaddah in this app is written in English, using a gender-neutral translation, and there is an icon on every page that allows for easy flipping to and from the Hebrew text. Three icons are used throughout the Hagaddah to enrich the user experience: a musical note, which plays sound recordings of prayers and songs; a speech bubble, which pops up additional written commentary; and a loudspeaker icon, which plays audio commentary from the influential American rabbi Irwin Kula. The activities for kids are simplistic, like coloring in pictures and playing a memory game, but do tie in to the holiday’s themes. The cookbook is quite bare, with only nine recipes, though they are varied, with at least a few dishes to get your holiday menu going. This app can be used on Passover itself or, for more traditionally observant Jews who do not use electricity on the Sabbath-like festival days that bookend the week-long holiday, to prepare for seder night before the holiday begins. Okay, this isn’t really a holiday; it’s the period between Passover and Shavuot, when Jews traditionally count the days and weeks until Shavuot, the holiday celebrating receiving the Torah. But it isn’t always easy to remember to ritually count each passing day. The free version of Sefiros, by Mosaica Press, uses the mobile device’s GPS to calculate what time the sun sets in your location, and rings an alarm to remind you to count that day. But being an omer alarm clock is about all it’s good for. For an app that takes counting the omer one step further, you’ll need to upgrade to the pay version of the app, Sefiros Grow ($4.99), which includes a 49-day guide to “spiritual refinement,” with tips for making counting the omer more meaningful. For example, on Day 1, “Kindness within Kindness,” the app provides action points for engaging with God, others and yourself. 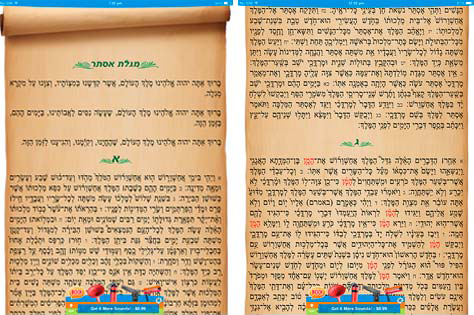 G-dcast created a great mobile app called the Five Books of Moses, which is perfect for the holiday of Shavuot.